Are you new to Device Magic? 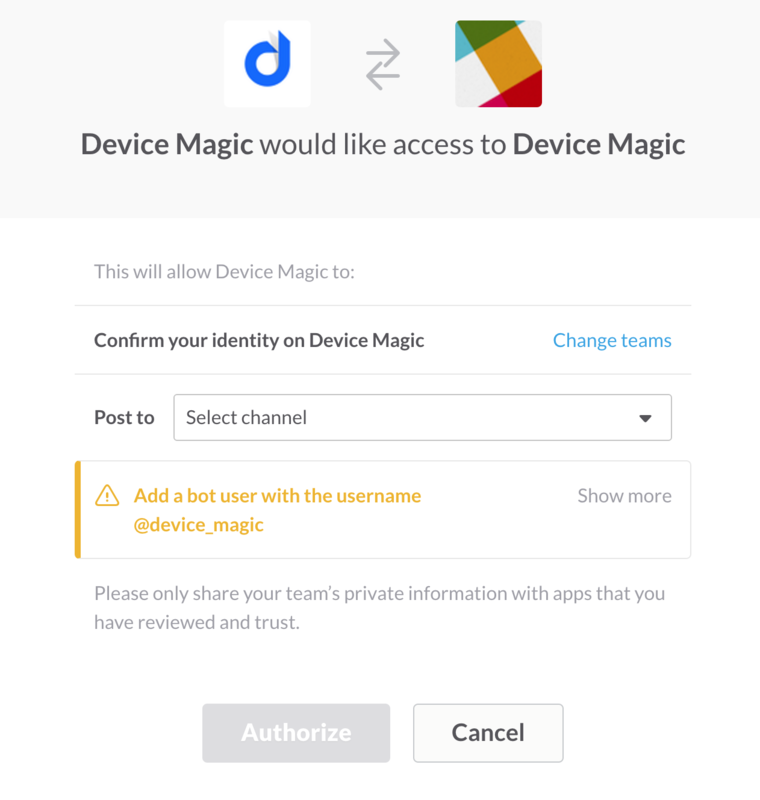 Click here to learn more about Device Magic and start a free trial! 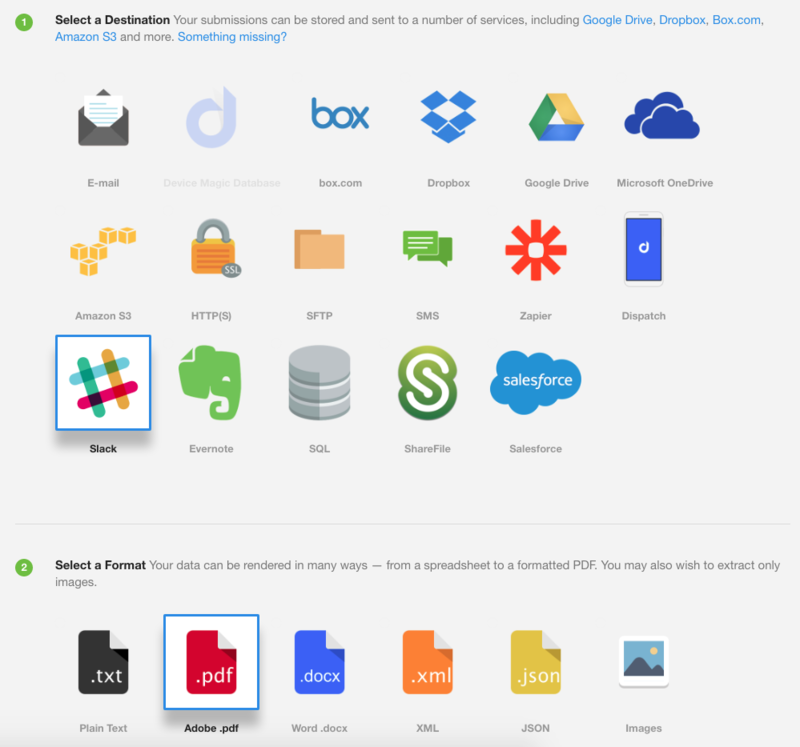 Once you have an account, come back here to learn how Device Magic users can send their form data to Slack with a PDF, Word, XML, Plain Text, or Images destination. In this article we'll give you a walkthrough of creating a Slack destination. To get started adding a new Slack destination - either head to Forms index page or create a new form. A new page will load, and on it you will see different destinations to send your data. Select "Slack" as your destination and the format in which you'd like to deliver the information. In this example, "PDF" has been selected. Next, click the "Start authorizing with Slack" link and a new window will appear with the sign-in options. After inputting your Slack account details and successfully signing-in, you can select the channel in which you'd like to send your data. Click "Authorize" and the window will automatically close. 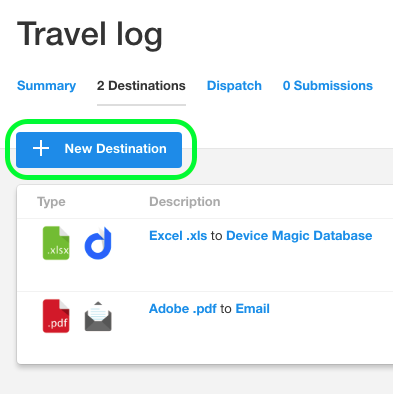 Now your Slack account and selected channel will be added to step 6 on your destinations page. This concludes our overview of adding the Slack destination. If you have any questions or comments feel free to send us a message at support@devicemagic.com or leave us a comment below.